Bagwell Marketing provides Restaurant Marketing and Advertising assistance for small to medium businesses. We offer a host of marketing solutions for restaurants of all sizes. No matter what kind of food you serve — pizza, family dining, bar-B-que, fast food or ethnic cuisine, we can help you reach new and existing customers. 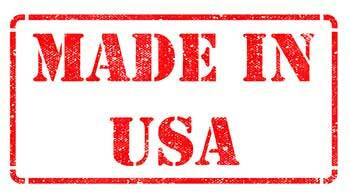 We are located in Dallas, Texas but serve customers throughout the United States. You’ll see some of the many restaurant marketing ideas for restaurants below. We have a complete line of Blue Generation shirts and pants that are Teflon treated and stain resistant. Includes embroidery of your logo. For fast food, pizza restaurants we have Imprinted T-shirts with your logo, company name or message. Catered By Conrad, a Dallas, Texas catering company, needed a website to showcase their service along with an easy form of contact. We can also develop a full-service site to deliver orders directly to you-including payment processing. This sweepstake is a great restaurant giveaway for any pizza restaurant or family dining restaurant. Comes complete with the toys, entry blanks, registration box and everything necessary for a giveaway. Use the completed entry forms to build a mailing list of your good customers. Keeping an e-mail list of your customers is a great marketing tool. We can manage your list, as well as mail to “opt-in” potential customers. Put the power of E-Mail marketing to work for your restaurant. We handle it all. Now put the power of text messages to work for your restaurant with a mobile marketing campaign. 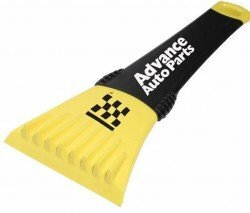 Our promotional division has mugs, ink pens and thousands of other promo items that come imprinted with your logo, name or message. Make the summer explode with excitement. 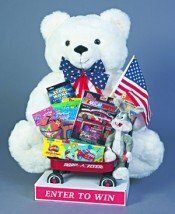 Boost sales and traffic with this Patriotic Stuffed Bear Promotion. Great for Memorial Day, 4th of July, Labor Day or any patriotic event. 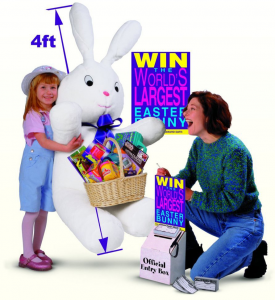 This promotion comes with entry box, entry blanks, stuffed Bernie the Bear and toys, plus promotional material. Also available as a Giant Stocking. For more information call toll free 1-866-281-8830 or Contact Bagwell Marketing. In addition to the advertising services shown above, we handle: newspaper ads, radio commercials, television commercials, message- on-hold systems, specialty and promotional products, yellow pages advertising and outdoor advertising. Our media department can coordinate media buying in all areas, from a local schedule to a national campaign. Our design staff produces brochures, posters, sales literature, point-of-purchase products, annual reports, print production, graphic design, corporate identity and more. Bagwell Marketing Company has over 40 years of experience serving clients in the restaurant industry. We are also specialists in direct response advertising. Some of the services our marketing firm offers include: Internet marketing, e-commerce packages, website design and search engine placement. Our research department provides site maps, demographic reports, and demographic mapping.